Cauliflower and brussels sprouts. This pairing may have been your childhood nightmare. But trust me when I say this salad will change things. For years I used to think of cauliflower as the worst part of those generic party-pack vegetable platters. You know the what I'm talking about…those platters with the clear translucent top and a big vat of ranch dressing in the middle. They're a staple at parties or potlucks when someone is too lazy to cook. And no joke - every time - the raw cauliflower is always the last one standing. Merp. But I'm learning we've had it all wrong: cauliflower really does have more to give. Roasting the cauliflower takes the flavor from meh to amazing. I couldn't believe the oven transforms this vegetable into delicious, caramelized bites of flavor! It's a far cry from the dry, raw blobs that litter party platters. So despite cauliflower's underwhelming appearance as broccoli's pale looking cousin, I decided to give it another chance. Because looks aren't everything, right?! This humble vegetable is part of the cruciferous family, which includes broccoli, kale, cabbage – and believe it or not, brussels sprouts too! This family of vegetables is often touted for its nutritional properties, which include being a good source of vitamin A, vitamin C and folic acid. With cauliflower being white, it doesn't actually contain vitamin A like the other cruciferous vegetables; but there's plenty of other good stuff like vitamin C, vitamin K and folate. In fact, a single serving of this salad should provide your full daily recommended value of vitamin C.
While the cauliflower is roasting in the oven, you can prepare the brussel sprouts. Or more specifically, brussels sprout leaves. We're about to get fancyyy. I went with brussel sprout leaves because they cook faster and seem fancy (95% because seem look fancy – but hey, just being honest). To peel a brussels sprout, you'll need to cut off the stem at the bottom. The outer leaves will fall off pretty easily, and then you'll need to start peeling back the other layers. As the brussels sprout gets smaller, you may find that it helps to continue cutting off more of the base to get better access to the leaves. Eventually, you'll have peeled the sprout down so small that you'll start to feel a bit ridiculous. When you start to channel Zoolander ("what is this, a center for ants?! "), you know it's time to stop peeling and move on to the next sprout. When buying brussels sprouts for this recipe, try to pick the bigger ones – it makes the peeling part a lot easier. Like any good salad this one is also brought together by a tasty dressing that's every bit as important as the dish. Personally I love the efficiency. 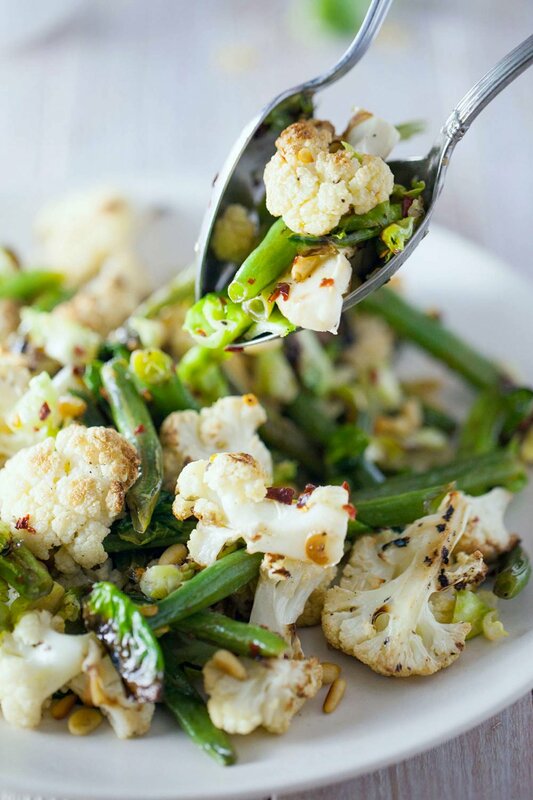 We'll make use of lemon halves and garlic that get roasted alongside the cauliflower. By the end, they emerge perfectly soft and caramelized. If you've never roasted lemons before, you're in for a pleasant surprise. They get juicier in the oven – so you end up with more lemony goodness! And who doesn't like roasted garlic? I finished the salad with some sautéed green beans for additional crunch. Then added a sprinkling of capers for some tang, and tossed in some lightly roasted pine nuts for straight up indulgence. I love this dish because it's a warm and comforting salad that can be enjoyed as dinner tonight, and then an awesome chilled lunch the next day. Serve this dish to friends and you'll look real fancy, real quick (true story). It's a dish that'll have you wishing you got on the cruciferous vegetable bandwagon a longgg time ago. Wash and dry the cauliflower, then cut it into large bite-sized pieces and place on a parchment lined baking sheet. Add lemons to baking sheet. Wrap garlic cloves (skin on) in aluminum foil and place on baking sheet. Bake for ~30 minutes, until the cauliflower is slightly soft and golden brown. While the cauliflower is roasting, prepare the brussels sprouts. Wash and dry sprouts thoroughly. Cut the flat end off the brussels sprout with a knife and begin peeling back the leaves. You may wish to cut off more of the stem as you get closer to the core - it'll help loosen up the leaves. Once you get to the center core, set aside. Repeat. Once done, finely dice the remaining cores. Place the leaves and diced cores onto a second lined baking sheet. Drizzle 1 teaspoon of neutral oil over the sprouts and stir to coat evenly. When there's 10 minutes remaining on the cauliflower, add the brussels sprouts to the oven. The sprouts need 8-10 minutes to cook. Check the brussels sprouts half way through, and flip the leaves to encourage even browning. Remove both baking sheets once cooked. Toast the pine nuts in a frying pan over medium heat. Stir regularly, until the edges of the pine nuts start to brown. This should take ~5 minutes. Once toasted, remove the nuts and set aside. Remove the tough ends from the green beans and slice in half. Heat the same frying pan over medium-high heat, and once hot, add 1 teaspoon of neutral oil to the pan. Saute the green beans and garlic, stirring frequently until tender (~5 minutes). In a small bowl combine olive oil and honey. Remove the roasted garlic cloves from the aluminum foil. Peel off the skin and slice off the ends. Then place garlic into the the olive oil mixture, and use a fork to mash it into the dressing. Squeeze 3 of the 4 lemon halves into the dressing (be careful - the lemons will be hot!). Add capers, chili flakes, salt, and pepper to taste. Depending on the size of your lemons, you may wish to add the remaining half lemon. Toss to combine and sprinkle with toasted pine nuts.